Yesterday was a bittersweet day for me. I went to a memorial for a friend’s husband that past away a few months ago. It was a celebration of his life. Later, the hubby, our son, and I decided to continue with this theme, and stopped by my Grandma’s house, my mom’s mother. She’s 88 years young, is still able to drive a car, and gets sassier every time I see her. Like most grandparents, she likes to give away little gifts, hand cream, new potholders, etc. However, on this particular visit, she brought out “the big guns,” the ultimate gift for a history-loving-picture-taker like myself. She has started to make copies of all the rare family photos. Yesterday she brought out one that I’d NEVER seen before, photos of her parents when they were in their late teens or early twenties. My Grandma guessed that this photo was taken during the late 1800’s or early 1900’s, well before she was born, before life had aged them physically. 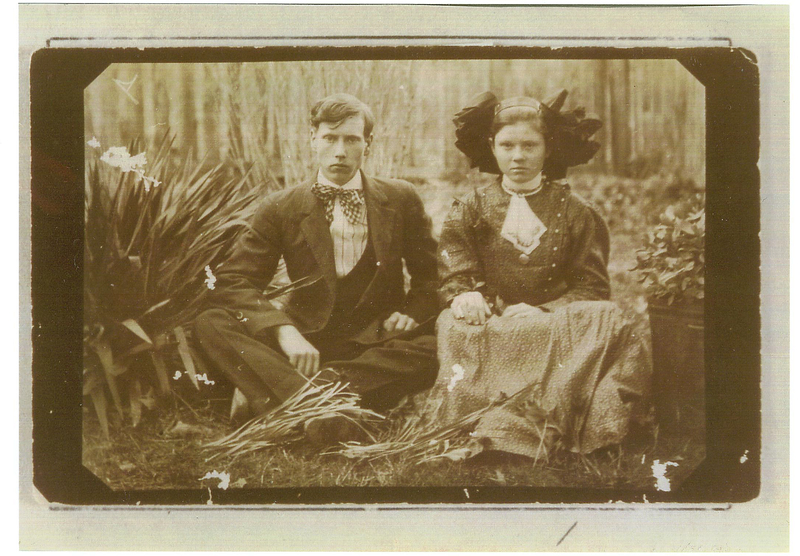 If you look carefully, you’ll see a locket under the handkerchief that’s pinned to my Great-Grandmother’s dress. I recognized it as soon as I saw the picture. That locket went to my Grandmother, to my Mother, and finally to me. It’s nothing fancy, but it has a history. My Grandmother had a photo that’s been misplaced over the years. It’s a picture of her cousin Becky in a Victorian looking dress. This photo doesn’t just resemble me, most of my family actually thought it WAS me, dressed up to look old fashioned. It was spooky to see a woman who looked exactly like me, born approximately one hundred years ago. Now, looking at this photo, I see more pieces of my personal puzzle. I see that I resemble my Great-Grandmother. We have the same nose, the same round face. My Grandmother told me that we’d look even more alike if she’d smiled for the picture. Ironically, she told me it was rare to ever see them NOT smiling. This morning, I woke up early. The sun was rising. I brought out this new-to-me photo. I wondered about the couple who were looking back at me as though through time. I get a peculiar feeling when I look at their faces. These people are related to me by blood. I have memories of my Great-Grandfather. He died a week before his hundredth birthday, but I have no memories of my Great-Grandmother. I wonder about her. I know stories about her life, but in my mind, I’d always imagined this aging woman, never a young lady. I’d never been able to put myself in her shoes before, to imagine what it was like to be her. Looking at the photographs of my ancestors has been wonderfully therapeutic. Seeing the faces that have come before me, and seeing my son, who will hopefully go on after me, I feel strangely secure. Life finds a way. Next postA Celebration of Life. These Photos were taken on 6-11-2011. Thanks Jo! I love learning about history, esp. the history of my OWN family. Have a great day!